It’s been incredibly difficult to get someone to help in the garden and I thought I’d solved the problem when the retired gardener in the village agreed to come and sort out our jungle. 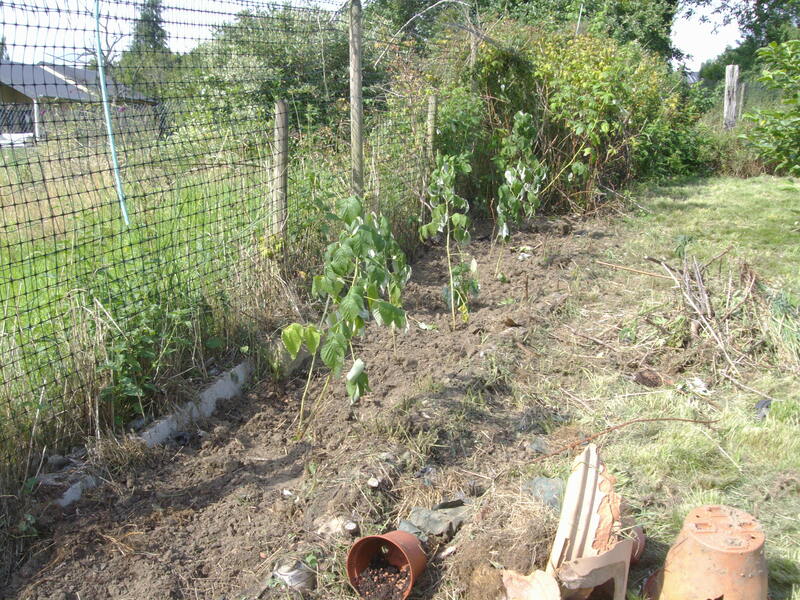 He came a few times in May and cut the grass but, despite the fact that I thought I’d expressed my views on weedkiller and Round-up in particular quite strongly, he sprayed the stuff all around and killed off the raspberry canes and devastated what was the vegetable patch. Now I wouldn’t want to eat anything that might grow there. All through June there was no sign of him. If I phoned he would say “I’ll come next week” but then it would rain and so I’d assume he wouldn’t come – and he didn’t. Then it was too hot to work outside especially as he has been told to take it a bit easier due to his health. All this time I looked around for someone else to ask and finally, the physio gave me the phone number of a retired couple who do his garden. 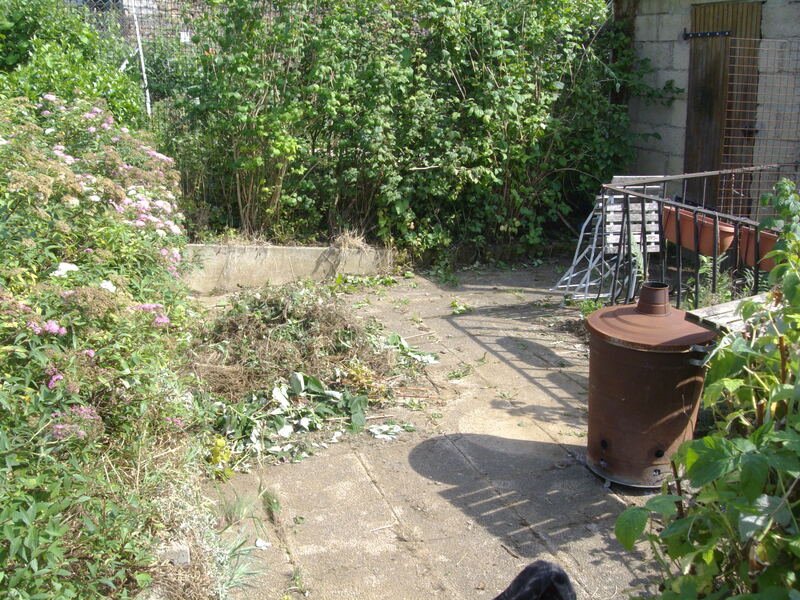 Of course, I couldn’t just take on someone else without sorting it out with the other chap first so I phoned him again and said I had visitors coming in August and I’d like the garden to look less like a jungle. 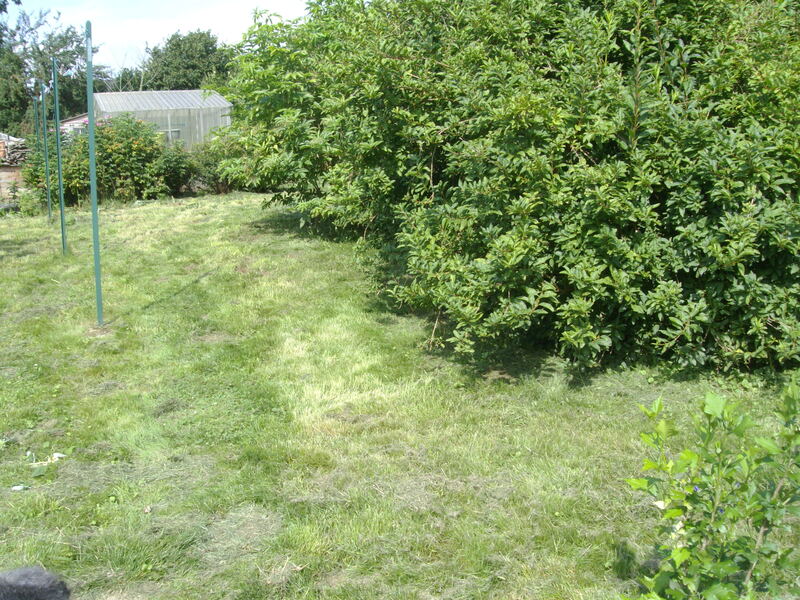 I explained that I hadn’t been able to cut the grass as I had suffered the last time I mowed the ‘lawn’. It hurt my feet to walk on the uneven ground. He agreed to come and ‘faucher’. To me, that means literally to scythe, but I assumed he meant he’d use a kind of robust strimmer. He turned up with a pair of shears! “Oh, I thought you meant the ‘ronces’. I found out later that that means prickly weeds. We looked at the garden together and he muttered something about using more roundup which led to a similar conversation concerning my views and he even ventured to agree with me. 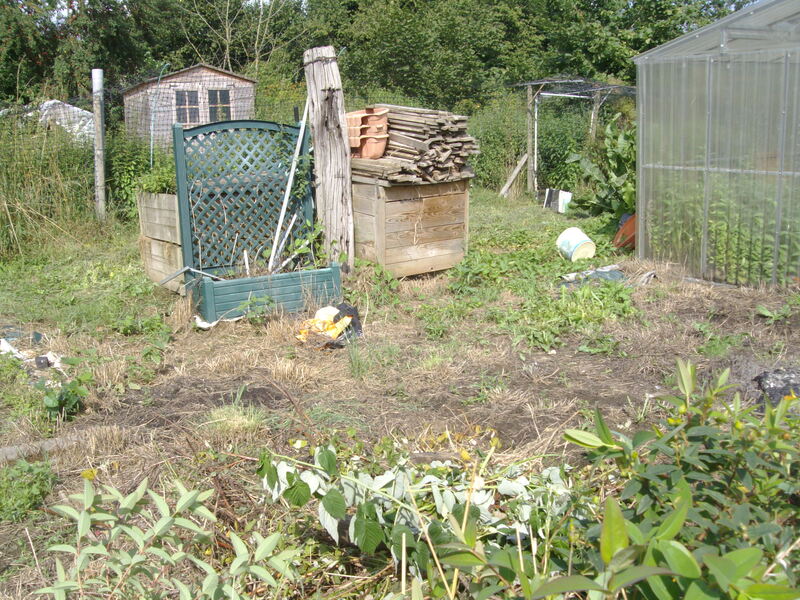 I tried to give him every opportunity to back out of doing the garden on health grounds but he insisted he had cut down his clients to just three, including me, so that put me in an awkward position. However, I wasn’t sure how seriously he took me when i said I didn’t want him to use weedkiller again so I rang him before he came to make it clear how I felt. I tried to be as polite and diplomatic as I could in a foreign language and at last, I think I got through. He strimmed the grass then mowed it. And promised to come and clear up the rubbish on Friday. He will make a bonfire so maybe we can celebrate November 5th this year! The priorité a droite rule is the most illogical driving regulation I have ever met. Who but the French would find it completely normal that you can be driving along a relatively main road and a car can come whizzing out from a turning on your right and you have to give way? According to the French HIghway Code which I have recently been trying to learn with CC you should change down to second gear when approaching a side road that has priority in case someone wants to come out in front of you. How mad is that? In our village, this rule applies to all unmarked roads. Unfortunately our road has a thick white line where it meets the ‘main’ road so we have to stop. The next road, on the other hand, has priority so we have to slow down and look carefully to see if anything is coming. The patient white van driver waved me on and I drove out in front of him. Will I ever have the confidence to drive out of a road without even looking to see if anything is coming like the French do? Of course, after several days of heatwave, we have the inevitable ‘Alerte Orange’ for heavy rain, storms and hail due to start this evening. Remembering the July when CC and I were caught outside in a hailstorm I have taken precautions in good time. 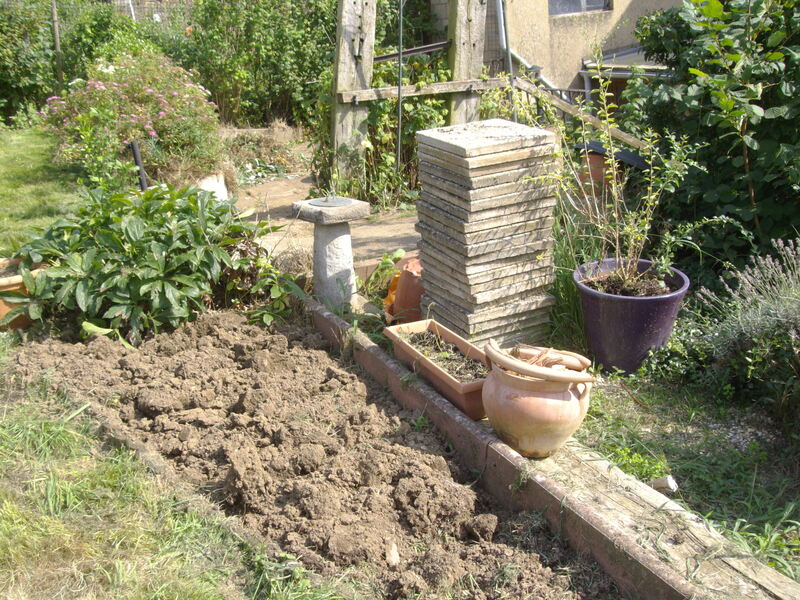 All the cats are indoors and curled up in their favourite armchairs; the chickens are safely shut in their coops – which have been protected with tarpaulins held down by heavy slabs and stones – and Kica has had her toilet trip in the garden. All is peaceful in the house. Bear has fallen asleep in front of the TV. He wants to watch the Tour de France but it has a soporific effect on him. Whale is having an afternoon doze and Fay and CC are upstairs in their rooms reading or writing. That leaves me with time on my hands; hence another post. One of the advantages of living in a rural setting is that one of the local farmers sells milk direct -straight from cow to you. The system is that you leave your bottle on the windowledge at the farmhouse and pick it up after the evening milking. Once a week I leave the money (3 euros 50 for 7 litres) on the windowledge with the empty bottle. The only problem is that milking times can vary and in the recent hot weather I try to collect the milk as soon as possible. The day before yesterday they were running late so I had to go to the farm (a bit further down the road) where I found Monsieur J. just about to fill the bottles. Yesterday I left it a bit later only to find that the milk must have been sitting there for some time as it was considerably warmer than ‘cow temperature’. We normally use the milk raw but I felt it wise to boil it this time. As for butter, we can buy it from a farm in the next village. The difference in taste is remarkable and at 4 euros for 500 grams it compares favourably with supermarket brands. If only I could get my act together and grow my own veg! Lulu used to take a gymnastics class for ladies but she gave up about five years ago when she was in her seventies because her husband became ill. I saw him once or twice in the chemist’s when he would sit on the chair while Lulu collected the prescriptions. Nearly a year ago Francine, a neighbour who helps out with Bear and Whale, told me that Lulu’s husband was seriously ill and she was helping her with his care every day as Lulu didn’t want to ‘be invaded’ by the carers from HAD (home nursing) as they came in threes! Poor Michel became steadily worse and there was a threat that he might lose a foot, then a leg with gangrene. They didn’t amputate in the end but he had a serious infection and died in hospital last week. In France they don’t wait long before the funeral and despite the Bank Holiday on Monday the cremation was arranged for Tuesday morning with interment of ashes at 4p.m. the same day. Francine said that Lulu had not put a notice in the paper as it would be a quiet affair but she would be happy to see me there if I wished to go. Francine went to the cremation and I did the morning stint with my invalids and then she came in the afternoon so that I could go to the cemetary here in the village. Friends and family arrived at the car park and greeted one another with a handshake or kiss and then Lulu arrived, on foot, and as I was on the edge of the group she threw her arms round me and we had a little chat. After that, a young lady who turned out to be her grand daughter came and greeted me and so did one or two other people I didn’t know. After a few minutes we all trooped through the cemetary to the Columbarium where the urns are placed. A young man in a suit, presumably from the funeral parlour, placed the urn on a table with a red velvet cloth and gave a reading about Michel and passing on. Then he invited the grand daughter to say a few words and everyone brought out their hankies as she talked about how he would take her on his knee and tell her stories when she was a child. Then the urn was put into a hole in the columbarium and the young man in the suit produced a basket of tools and proceeded to stick the plaque over the hole with a large ‘gluegun’ and then polish it with a duster. By this time, people were chatting in little groups and then Julie, the home nurse arrived so I went to say hello to her. “Would it be impolite to leave now?” I asked her. “Not at all, some people are already going” was her reply. So I wandered back home and got back in time to see Francine who had just finished helping the carer. I told her how everyone was moved by the grand daughter’s words and she said the same thing had happened at the service in the morning. I don’t know how long Lulu will be surrounded by her family but she’s a courageous little lady and I’m sure she will adjust to life on her own. In a way, Michel’s death is a relief for both of them as he had suffered a great deal and it must have been hard for her to watch. Maybe in a few weeks I’ll ask her round for a coffee. M: “Next to the presbytery”. M: “No, Isabelle arranged it”. Having been reassured that we were all properly attired the conversation turned to other things. Beattie’s babies are now holding their own with the flock although they still get chased away from the food sometimes so I give them their share inside their coop where the door is only open wide enough for them to get in. 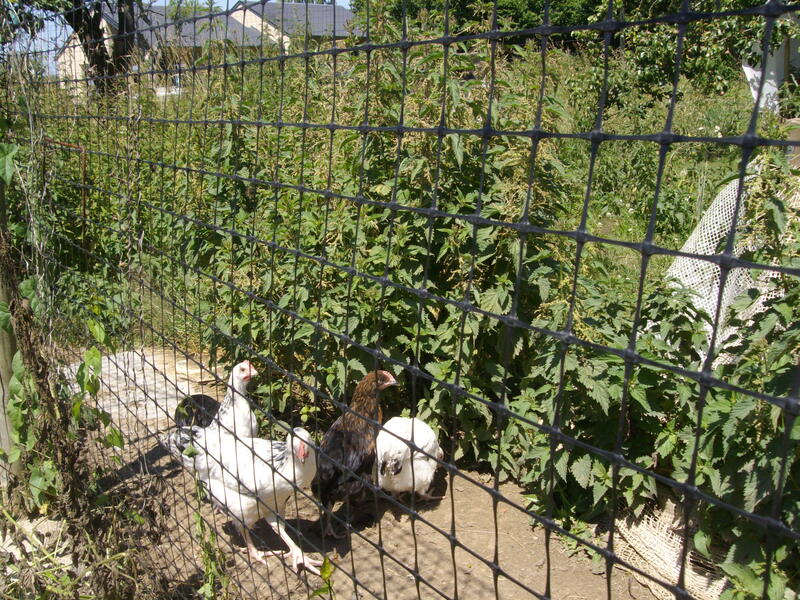 In this picture you can see Sorcha, Sasha and Sally (the white ones) and Milly (black with brown neck feathers). The bottom belongs to either Molly or Mandy who are very difficult to tell apart now that they are about the same size. Beattie is back to her habit of flying over the fence to escape the attentions of the cockerels. She comes indoors whenever she can but it causes havoc when she upets the catfood and leaves her visitng cards on the floor. I can’t risk her upsetting Briony now that her babies are hatching. Briony made herself a nest outside and there were 14 eggs in it by the time I discovered where she was hiding. Fortunately there hadn’t been any rain because she was at the bottom of a slope and her nest would have been flooded. 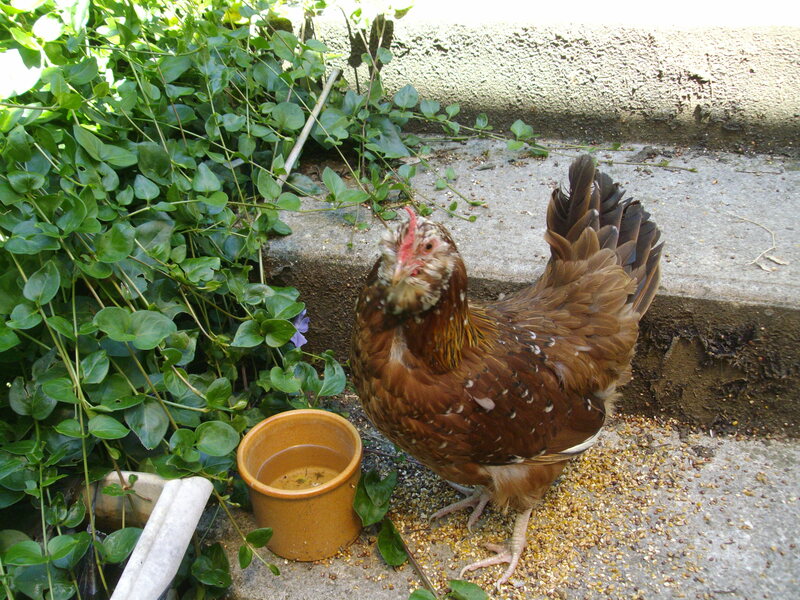 I brought her indoors with 12 of her eggs but two were cracked. As time passed she rejected more eggs until there were only seven. 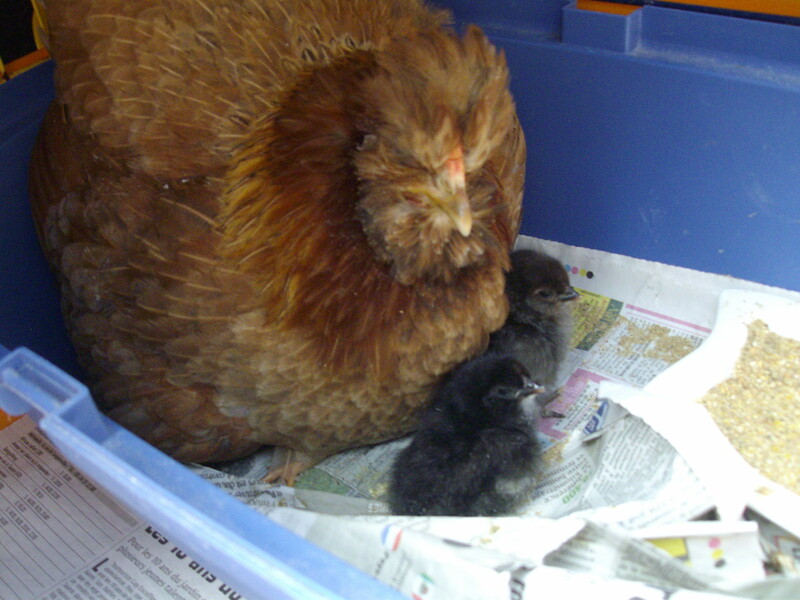 Briony is a proud mum at last and the daddy is Hector, my lovely Maran cockerel. Sorry this is not a good photo as you can only see his head. 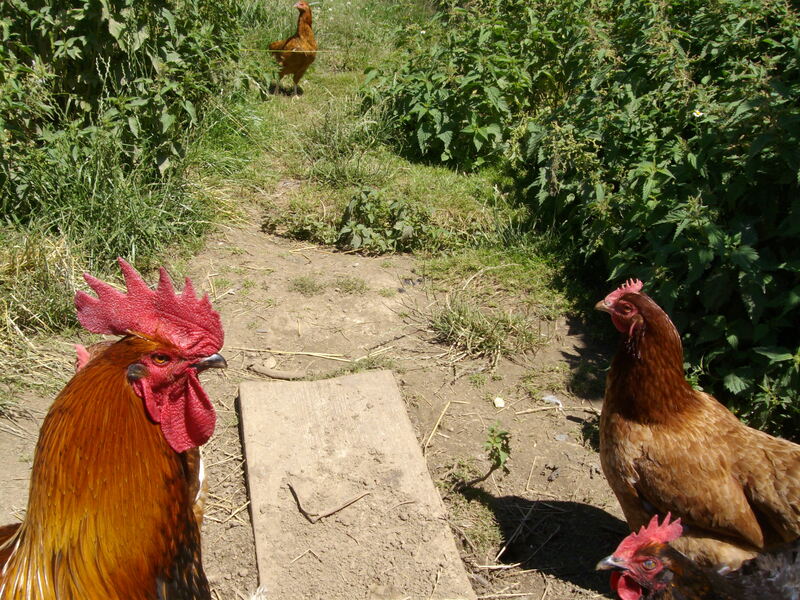 On the right is Harriet and in the corner it’s one of the Maran hens but I can’t see which one. At the top you can see Ruby, one of Briony’s last brood, born in March but I had to buy chicks as none of her own hatched that time. Hector has just one daughter in the flock – Hermione, born to Henrietta last year – so I’m delighted to have some more truly homespun chicks. Update: at 5p.m. I found another empty shell but I haven’t seen the third chick as yet.